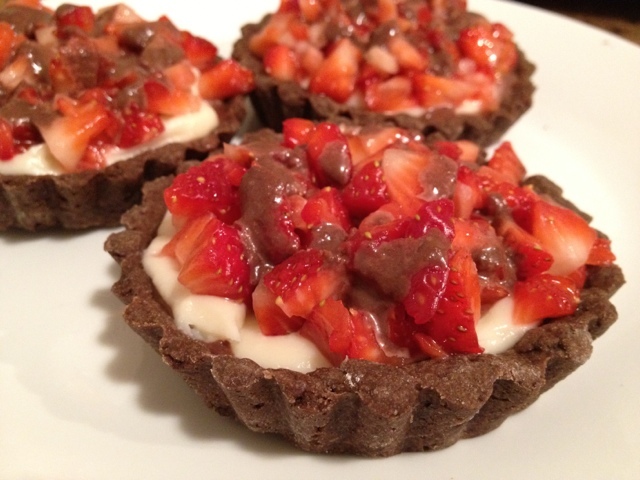 So I don’t know why I got this idea in my head tonight, but I wanted to make chocolate strawberry tartlets with a cream filling. 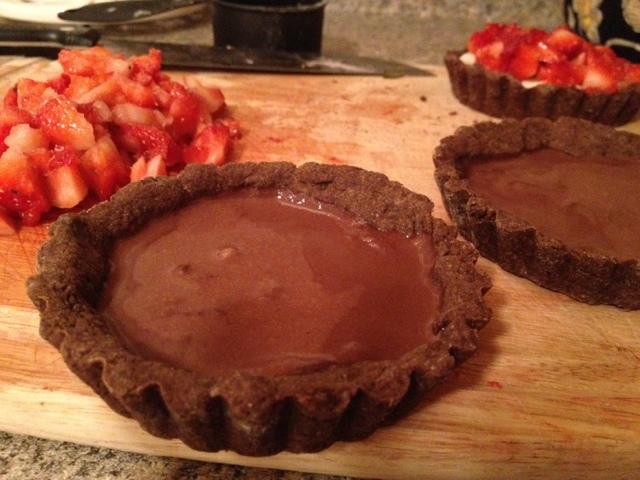 Maybe it was because I recently purchased 4″ tart pans to make the super rich and decadent Chocolate Truffle Tartlets. Or because I had strawberries and cream cheese in my fridge. Or because it was thuderstorming so I couldn’t go running, so obviously the next best solution for what to do after work was bake and drink wine. 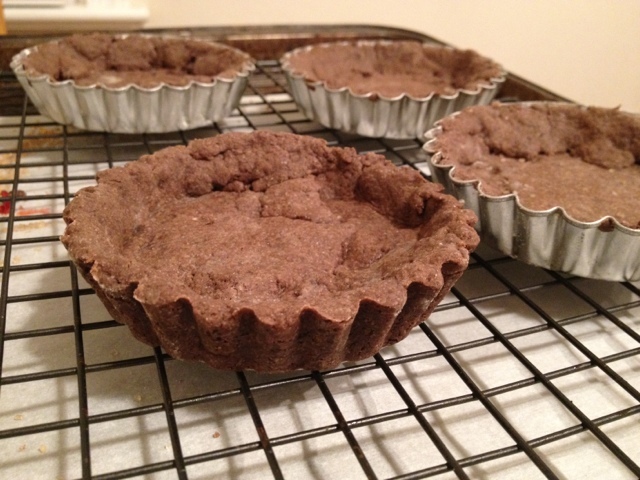 For the chocolate tartlets, part of Tuesdays with Dorie, my mom and I made the chocolate crust recipe. 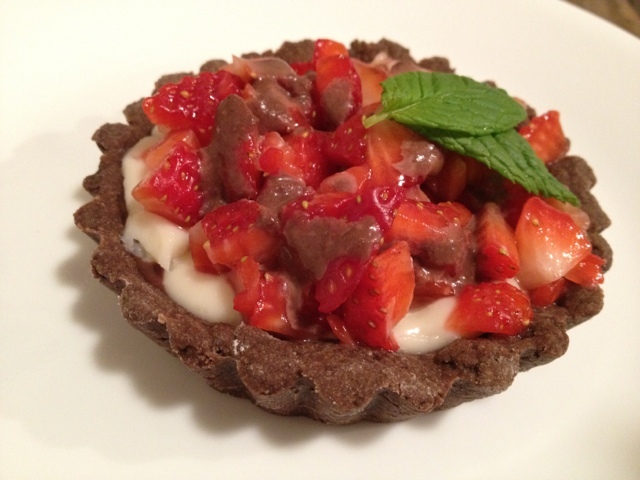 I decided to halve it this time, because really, do I need eight little tarts for myself? Probably not. So I made four. The dough is super easy to make, you just mix the flour, cocoa, and sugar, then work in the butter with your fingers, add an egg yolk and ice water, smear it across the counter to work it together, and refrigerate. Nothing too tricky. I looked up recipes for ideas for the filling. I knew I wanted cream of some type (pastry creme? cream cheese?) and strawberries. 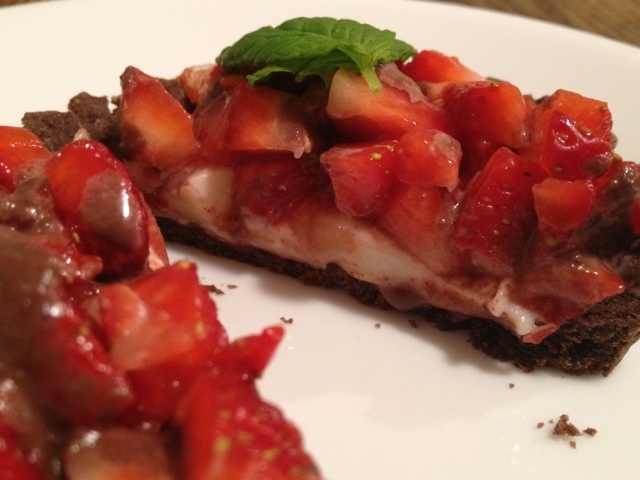 I found this strawberry cream cheese tart on Annie’s Eats blog and decided that the ganache and cream cheese fillings would be yummy. Unfortunately, ganache doesn’t work out as well when you combine bittersweet chocolate with half-and-half rather than heavy cream. Well it may have worked better also if I didn’t use wayyy too much dairy compared to chocolate. So the chocolate layer didn’t set up as firmly as I had hoped, but it still worked alright. It was chocolate of course, so you can’t go too wrong. I mixed softened cream cheese with powdered sugar and vanilla for the next layer. I tried to spread this on top of the make believe ganache at first, but the chocolate just wanted to mix with the cream. I ended up piping it on by filling a Ziploc with the cream cheese mixture and snipping off a corner. I also need to practice laying strawberries into appealing concentric circles. 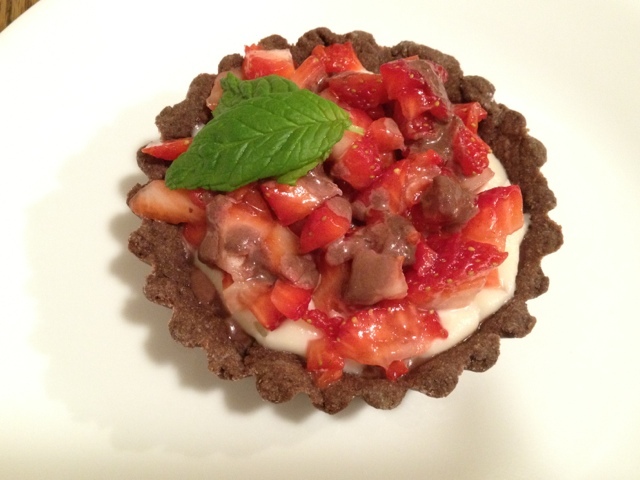 My first try was a major fail, so I figured chopped strawberries would work just as well. They do taste the same after all. And actually, I think they are easier to eat because they are more bite size. And they turned out so pretty. Though there are a few things I’d do differently — make a more suitable ganache, drizzle with simple melted chocolate rather than my wannabe ganache, and perhaps make a French pastry creme — these were still a success in my book. Super sweet. 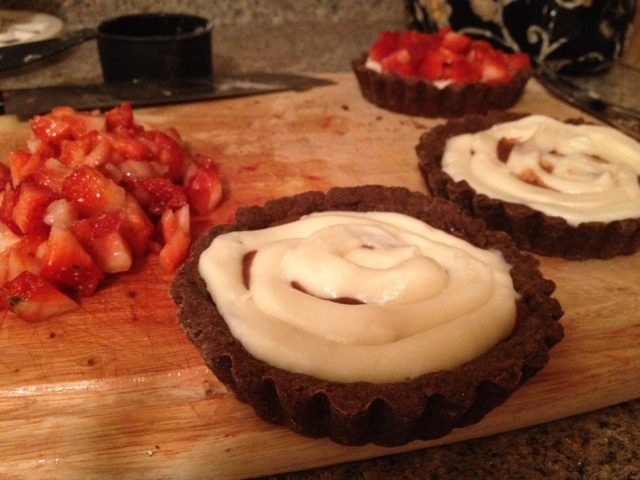 But at least I got to use the baby tart pans again. Next ›Pests: Get out of my garden!